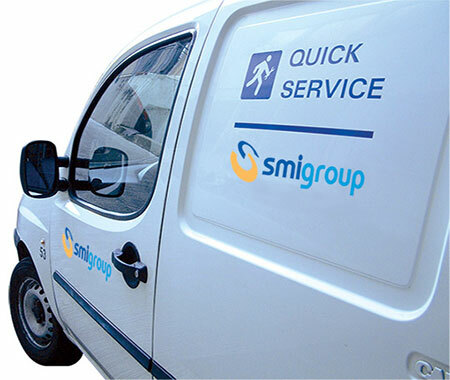 SMI's technical staff is at customers' disposal wherever in the world to quickly and effectively provide technical support and consultancy. The Customer Service Center of SMI avails itself of travelling field service engineers speaking various languages and boasting a proven practice in the mechanical, electrical and electronic domains; they operate from both Italy-based SMI headquarters and the numerous foreign branches of the SMI Group. In case the problem arisen on the machine cannot be solved through on-line support, SMI travelling field engineers are ready to intervene personally at the customer's factory in the shortest possible time, in order to quickly restore the machine's full functioning. SMI travelling field engineers are also available to carry out planned maintenance interventions, be it ordinary or extraordinary, in order to ensure the machine's perfect running and efficiency conditions during its entire life cycle. Should the end user wish to widen the machine's functions or add new applications to it, SMI's Customer Service Centre provides skilled personnel with proven ability and experience to rapidly carry out mechanical or electronic updating operations and to minimize the impact of their work on the factory's production schedule.